We are interested in interfaces between biological materials and inorganic surfaces. Especially, we employ two-dimensional (2D) nanosheets as the inorganic surface because of their unique physical properties. In our previous researches, we have developed several types of peptides which have abilities to form ordered nanostructures on those 2D nanosheets, and understood the mechanism of their interactions in the manner of self-assembly and (opto-)electronics. 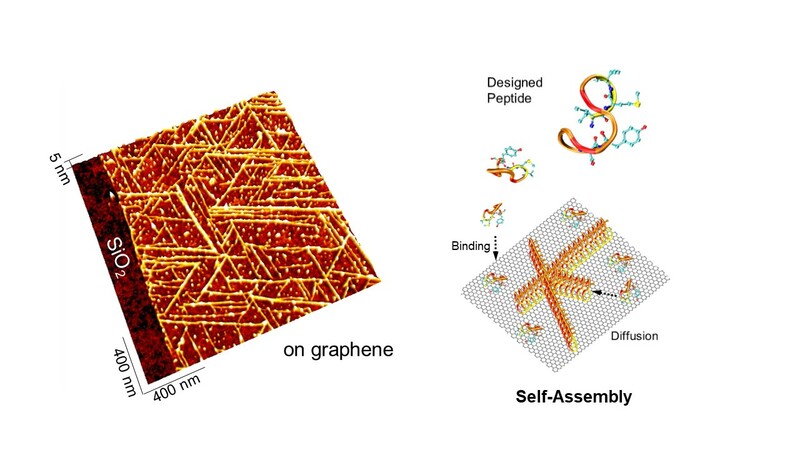 Desinged peptides spontaneously organize into long-range ordered structures on 2D nanomaterials such as graphene. Peptides in solution first bind to the surface. Next, peptides diffuse on the surface to find each other. Then, they assemble into organized structure. The peptide has tyrosine, aromatic amino acid. Due to the pi-pi interacton, the peptide may stick on the graphene surface. In fact, the peptide forms nanowires on the single-layer graphene as shown in the image of atomic force microscope. Interestingly, there is no peptides found on silicon dioxide surface. 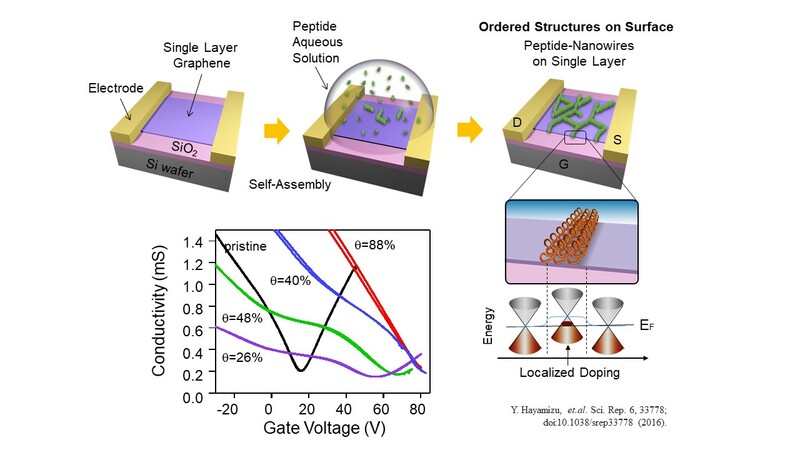 It indicates the specific peptide binding to the graphene surface.